The chores took extra long to finish today, again, because I just couldn't soak up enough of the sweetness into my pores. I can't express how rare and treasured these days are in Texas - bright, cool, dry, refreshing. I will ache for this day, come August. Lots of us are wondering what this warm winter will bode for the summer - will it be even hotter than last year? Will the bugs be worse for lack of freezing temperatures? Until I saw my redbud tree budding out today, I wasn't sure whether to believe that spring had really come for good. The native trees know, so I trust them. Conversely, never trust a Bradford pear - they are gullible and easily deceived into believing winter is over, and then getting frostbitten by a freak ice storm, and waking up dead. They ain't from around here. Tomatoes aren't native either, and need special handling. Mine have grown a bit spindly indoors, just getting the sun through the windows so far. Today, it seemed mild enough for them to play outside on the front porch as the sun lowered toward the horizon. I think they liked it. The woolie beasts are so anxious to get out of their winter coats--literally itching to be sheared. 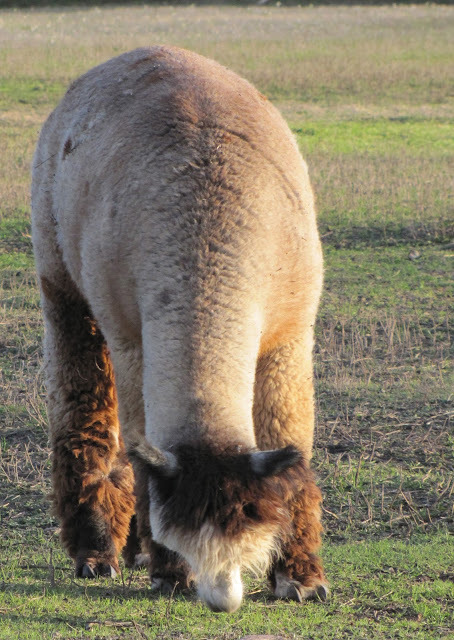 Joseph looks like the Michelin Man of alpacas - I really cannot wait to see him out of his fleece. Everybody is fluffed up and ready to move on to the naked portion of the fiber year. 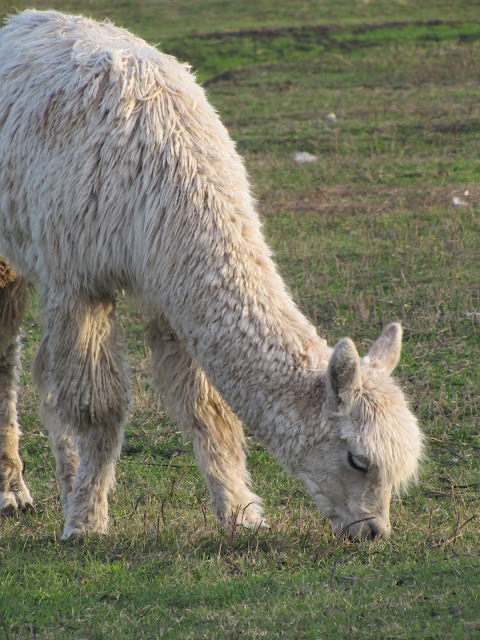 Tomorrow, it is supposed to get up to nearly 80 degrees, and you really don't need an alpaca coat in that kind of weather. The hens are digging this, though. The days have lengthened, and the girls have ramped up their laying. I think the sight of all this new green grass has all of us a bit rejuvenated. The bugs are waking up and providing lots of food and entertainment for the flock. We should also be seeing nice orange yolks in the eggs, with all this free protein and greenstuff adding to the hens' nutrition. The guineas are, well, guineas. Loud and crazy, like always. They're pretty faithful that way. I spent too much of the day inside working on stuff that just had to be done. But I'm going to regret every minute I didn't get to enjoy of this day outside in the fresh air. Forgive the cliche, but, I wish I could have bottled it. "Never trust a Bradford Pear" . . . HAHAHAHAHAHA! Love it!